Canned pork chop pieces on the left; canned beef steak pieces on the right. Canning meat is an ideal way to stock up during sales. When you can the meat, it will never get freezer burn, and it will last for many years, rather than just 6 months to a year in the freezer. Plus, the end result is more convenient (the meat is already cooked and doesn't need thawing). I've already taught you how to make fantastic canned chicken (it's super easy, too!). I've also talked about ground beef, and beef stew chunks. I've even showed you how to can ham. But what about other types of pork? If you read up on canning pork, you'll find many people hate it, saying it ends up bland. But that's just because they don't know my secret! 2. Place the pork in a roasting pan. (I've also used a baking sheet with high sides for relatively small pieces of pork, like chops.) If you are using chops, place them in a single layer; they can touch each other. 4. Add stock or broth to the roasting pan or baking sheet. If you have pork stock, use that. Or you can use chicken or beef stock, or any mixture of these three. The stock should go at least 3/4 of the way up the sides of the pork. (For chops or steaks, I usually bring the stock almost to the top of the meat.) Cover the roasting pan with its lid, or place foil over the baking sheet. 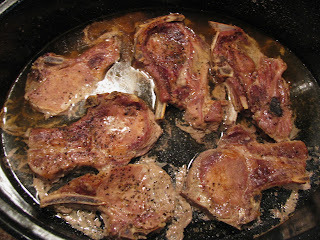 Seasoned pork chops in a roasting pan filled with pork stock. 5. Pop the roasting pan or baking sheet in the oven and bake for 1 1/2 hours. 6. Very carefully remove the lid from the roasting pan or foil from the baking tray. (There will be lots of hot steam.) If at this time you notice most or of the liquid is gone (which always seems to happen when I use a baking sheet instead of a roasting pan), add a little more stock. Bake for another 1/2 hour. In the meantime, heat up more stock on the stove and prepare the pressure canner, jars, and lids. 7. Remove the pork from the oven and allow it to cool in the pan until you can handle it. Remove any bones; this is quickly done because the meat should fall off the bone very easily. 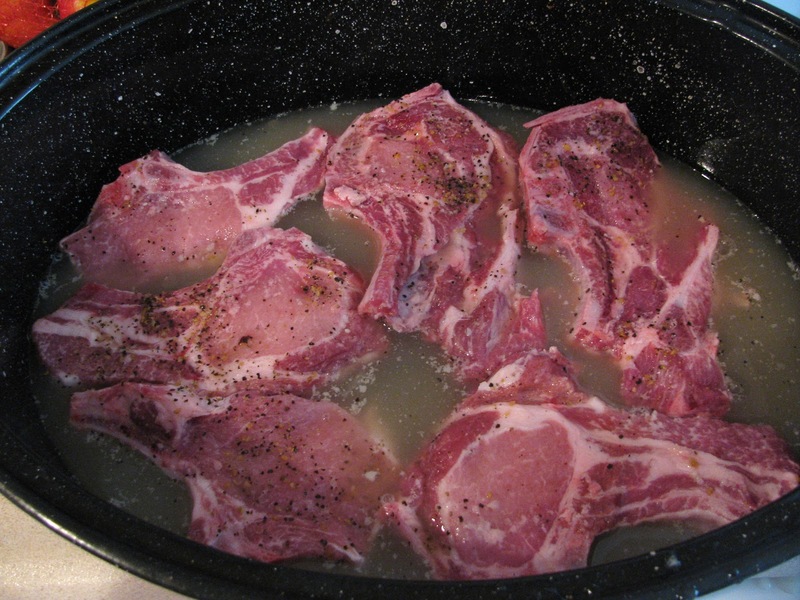 (Set the bones aside and use them to make pork stock; learn how to make stock here.). 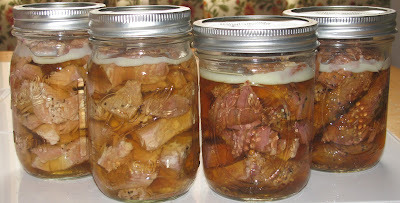 Removing the bones is not optional, since leaving them in can interfere with properly heating of the meat while it's in the canner - which can result in canned meat that goes bad. Also remove any remaining fat from the pork. I then cut the pork into large chunks, but you could also slice them into strips that will fit into your canning jars. Left: Pork fat (for the chickens). Middle: Usable pork meat. Right: Pork bones (for making stock). 8. Pour whatever pan juices there are through a sieve and into a measuring cup or bowl, and add the liquid to the stock on the stove. Bring the stock to a boil. 9. Pack the pork into jars, leaving 1 inch of headspace. Try to keep the rim of the jar free of grease; a funnel helps. Add hot stock to the jars, retaining 1 inch of headspace. Bubble the jar. Wipe the rim of the jar clean; I recommend putting a little white vinegar on a paper towel and wiping the rim with it. Switch paper towels with every jar. Place a lid and screwband on the the jar and place in the canner. Although this may seem like a lot of steps, there is very little actual work time. It took me about a total of 25 minutes to prep about 9 1/2 lbs. of meat and get it in the canner. When it's done, you'll have flavorful, tender meat perfect for adding to stews, soups, beans, or rice! *NOTE: If you live at a high altitude, read this important information about adjusting canning times. * My freezer is pretty full. * I tend to forget to get food out of the freezer in time to thaw it for meals. * If I can it, I never have to worry about power outages. * Canned stew meat is ready to go; I don't even have to cook it before adding it to recipes. 1. Partially cook the stew meat in a skillet with just 1 tablespoon or less of olive oil added. Brown on every side, but leave the center pink. (Use tongs to turn the meat; forks produce holes that let the meat's juices escape.) Work in batches, wiping the skillet free of fat after every batch. 2. Heat the broth in a pot on the stove until just boiling. 3. 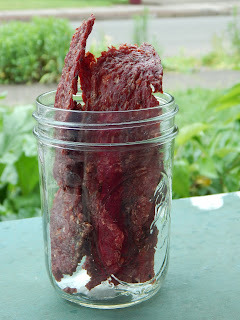 Fill jars one at a time with the stew meat, leaving a generous 1 inch between the meat and the top of the jar. Ladle hot broth over the meat, retaining 1 inch of head space. Use the handle of the large plastic spoon to remove air bubbles from the jar. Wipe the rim of the jar with a towel. Place a lid and screw band on the jar. Screw down until just tight. Use the jar lifter to place the jar in the pressure canner. 4. Repeat step 4 until all the meat is gone. 5. Place the lid on the canner and lock it in place. When steam begins appearing through the vent, wait 10 minutes, allowing the steam to keep escaping. Then, place the canner's weight on the vent. When the gauge reads 10**, begin timing the "cooking" of the jars: 75 minutes for pint jars and 90 minutes for quart jars. 6. Turn off the heat and let the canner return to 0. Wait 3 minutes and remove the canner's lid. Wait 10 minutes and use the jar lifter to move the jars to a wire rack or a towel placed over a counter to cool completely. 7. Allow the jars to cool, untouched and undisturbed, for 24 hours. After 24 hours, press down on the lids to make sure they sealed properly. If well sealed, the lids will not move up or down when you press on them. * You can use store bought or homemade beef broth. Learn how to make your own stock here. It may be tempting to use water instead of broth, but this will make the meat very bland. Don't feel you're wasting stock! When you open a home canned jar of stew meat, just use the liquid for your cooking. ** If you live at a high altitude, read this important information about adjusting canning times. Canning meat is one of the best uses of canning know-how. It allows you to purchase meat when it's at its most affordable, and then easily turn it into something that will last for years without spoiling. Plus, in my opinion, it actually improves the meat! 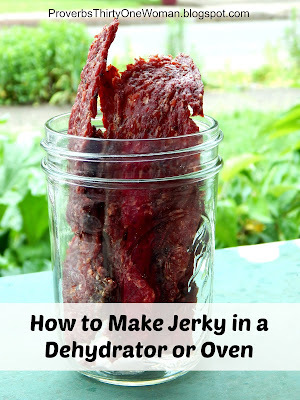 (Because the canning process makes the meat super tender and moist.) 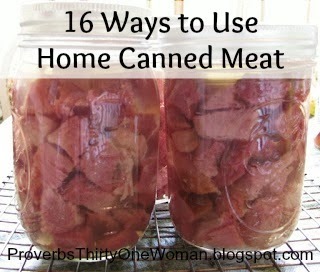 Best of all - having canned meat on hand is super convenient and really speeds up meal-making. Homemade pizza featuring home canned chicken and home canned bacon. 1. On homemade pizza. If you have canned chicken, try using Ranch dressing as the pizza sauce. 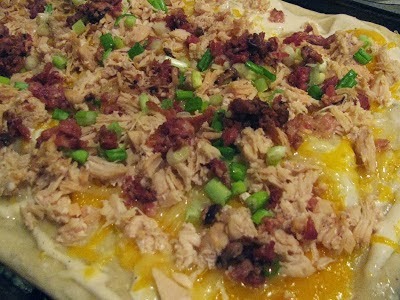 Add cheese, canned chicken, and maybe some green onions. Canned bacon is also terrific on pizza. 2. In salads. Canned chicken is perfect for any type of salad - fresh green, pasta salad, egg salad, etc. 3. Warmed up in a skillet. Canned ham, pork, or beef is great this way. I usually serve it alongside eggs , toast, or pancakes. 4. As sandwich meat. You can warm it up if you like, or leave it cold. And it's so much healthier than nitrogen-laced deli meats! 5. In scrambled eggs or omelets. Since canned meats just need warming up (not cooking), they are perfect added to eggs as you cook them. 6. As part of a hash or scramble. Canned ham is my favorite choice here. A scramble featuring home canned pork. 11. In chili. Canned ground beef, beef chunks, or pork chunks are ideal. 13. In stew. It really speeds up the cooking, because the meat is already tender and cooked. 14. Meat pies. An easy meat pie is just beef stew put between a bottom and top pie crust, so either beef or pork chunks or ground beef work here. 15. Shepherd's pie. Try canned ground beef, beef chunks, pork chunks, or lamb chunks. 16. In a pot of beans. Canned bacon adds terrific flavor to beans. 17. Any way you'd use frozen, cooked meat. Except canned meat doesn't require thawing! * Whenever possible, use the liquid from the jars - there's a lot of flavor there! So if you're making soup, for example, pour the liquid from the jar into the soup instead of just dumping it down the sink. * Canned ground beef has a different texture from the ground beef you are used to. It is softer and more moist. So I recommend always heating it by itself in a skillet; the heat will remove some of the meat's moisture, making it more like freshly-browned ground beef. * When cooking anything that takes more than just a few minutes to make, always add canned meat at the very end of cooking. If you don't, the meat may turn to mush because it's already so tender and well cooked. Really, you just need enough time for the meat to become heated through - perhaps five minutes before the rest of the dish is done. Ever bump into a canning term that leaves you scratching your head? Learn what that term means here, in Proverb's 31 Woman's Canning Glossary. Can't find a certain term listed? Be sure to email me ; I'll provide an answer and add the term to the Glossary! Alum: In older prickling recipes, alum is sometimes called for to add crispness. However, large doses of alum can cause illness, including nasea and gastrointestinal problems. Therefore, it's no longer recommended for pickling. Approved Recipe: A canning recipe tested and approved by the USDA. 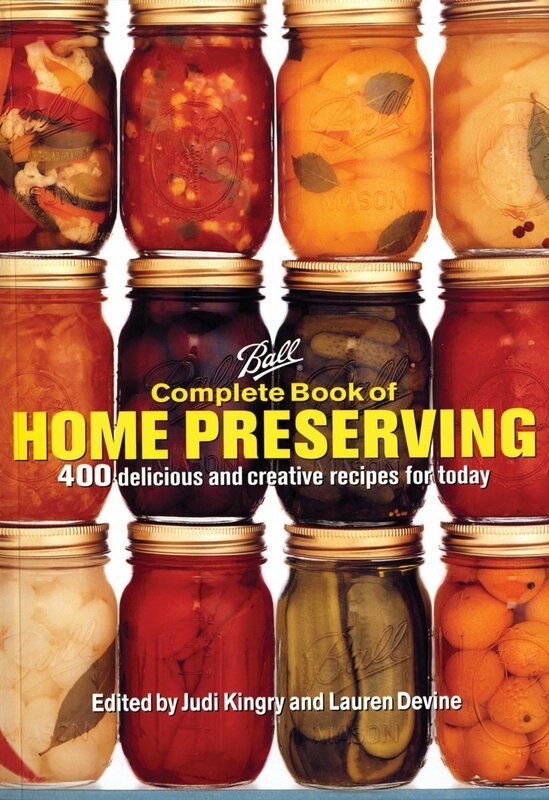 You will find approved recipes in modern day canning books, such as The Ball Complete Book of Home Preserving, The Ball Blue Book, at the website of the National Center for Home Food Preservation - and on this blog! Following non-approved recipes, or older recipes (even from the 1980s), is not considered safe because we now know more about food acidity and temperatures needed to kill harmful bacteria. The old canning rules simply aren't as safe as the new ones. Ascorbic Acid: The scientific name for vitamin C. When used in canning, it prevents the discoloration of fruits and vegetables. Bacteria: Microorganisms that are found everywhere. Certain bacteria can lead to serious illness or death in humans and may thrive in low-acid, home canned foods that aren't heated to 240 degrees F. for a specific period of time. This is why low-acid foods (like vegetables and meat) must be canned in a pressure canner. Boil: Heating liquid until bubbles burst over the surface. See also "Boil Gently," "Simmer," "Full Rolling Boil," and "Boiling Point." Boiling Point: The temperature at which liquid reaches a boil - 212 degrees F. at sea level. Full Rolling Boil: Boiling rapidly; stirring does not prevent the liquid from continuing to boil. To obtain a gel in jam or jelly, it's vital to cook at a full rolling boil. Boiling Water Method: Also called "Bath Water Method." This is one of two ways to home can food and is used only for high-acid foods such as fruits, pickles, and jams. When jars of food are surrounded by boiling water and a temperature of 212 degrees F. is maintained, harmful bacteria is killed, making the contents of the jars safe for eating. Botulism: Food poisoning caused by eating toxins caused by the spores of the bacteria Clostridium botulinum. 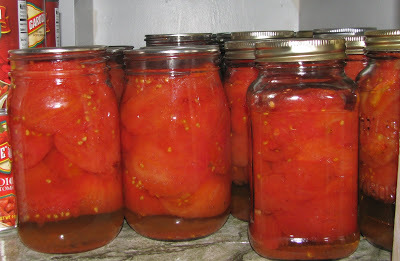 In canning, using only approved recipes with correct processing times, and using the proper canning technique (boiling water vs. pressure canner) prevents botulism. Brine: Salt-water (with or without added herbs) used in pickling. Bubble Remover: A canning tool that's shaped like a stick and is not metallic. 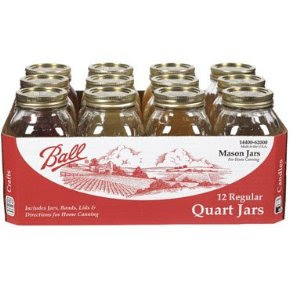 To use, it is moved straight up and down in the jar to remove most air bubbles. A handle of any non-metallic utensil (such as a spoon with a long handle) may be used instead. Calcium Chloride: A natural mineral salt used to crisp food (especially pickles) in canning. Candy Thermometer: A thermometer with a hook or clip on its side that's used for attaching the tool to a pot or pan. Used in canning when making soft spreads made without additional pectin. Canner: A specially designed pot used for home canning food. "Canner" may refer to a Water Bath Canner or a Pressure Canner, both of which have very specific uses. Canning Salt: See "Pickling Salt." Chutney: Spiced mixtures of vegetables or fruits with vinegar, typically used as a spread for breads or meats. Citric Acid: A natural acid found in citrus fruits like lemons. Used in canning to prevent the browning of foods or to increase acidity. ClearJel: A brand name product used as a thickener in canning. Thickeners like flour and cornstarch break down in canning and should not be used. ClearJel does not. Conserve: Similar to jam, made with two or more fruits, plus nuts or raisins. Cold Pack: To place food inside canning jars when it is unheated and uncooked. 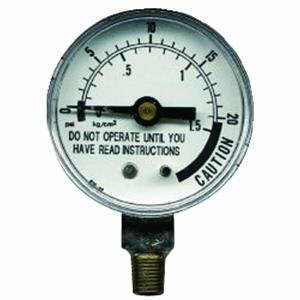 Dial Gauge: On a pressure canner, a regulator that indicates the amount of pressure in the canner. For safety's sake, have your gauge tested every year at a local extension office. 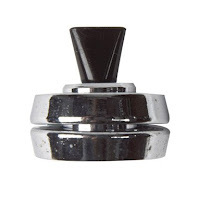 Or, buy a weighted gauge for your pressure canner (see "Weighted Gauge"). E.coli: A type of bacteria common in human intestines. A strain, Escherichia.coli 0157:H7, produces toxins that may cause diarreah, headaches, chills, fever, or even death. Fermentation: Fermentation is a naturally occurring process caused by yeast. 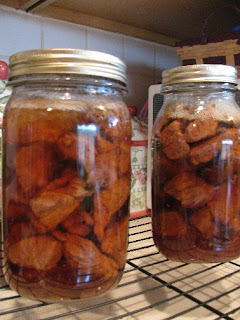 In canning, if yeasts haven't been killed during processing, the food will bubble, become scummy, and break the jar's seal. Some foods are fermented before canning, such as certain kinds of pickles or sauerkraut. Fingertip Tight: A phrase used to describe how snugly jar ring bands should be. To put a screwband on "fingertip tight," use your fingers to turn the band until resistance is met, then tighten just a little further. Over-tightening bands can result in buckled lids or lids that don't seal. Bands that are too loose may also cause lids to not seal. 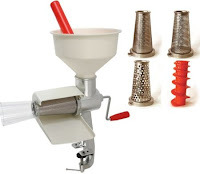 Food Mill: A device used to puree cooked, soft food, such as tomatoes or apples. Fruit Butter: A thick, soft spread made by slowly cooking down fruit and sugar. Funnel: A utensil that sits on top of a canning jar to make packing food into the jar easier and less messy. 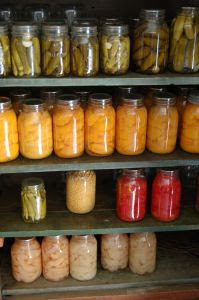 For canning, it should be plastic, since some foods react with metals. 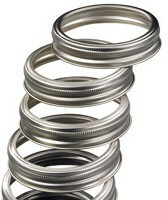 Gasket: A rubber ring that fits inside the opening of a pressure canner and creates a seal so no steam can escape. Gel Stage: The point at which a soft spread comes to a full gel: 220 degrees F or 8 degrees F. above the boiling point of water. Headspace: The empty space between the food in a canning jar and the top rim of the jar. Correct headspace is necessary so food can expand during the canning process, and so a strong vacuum seal can be created, sealing the jars. Jam: A soft spread made with crushed fruit. 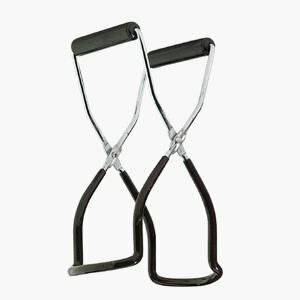 Jar Lifter: A tool designed for safely lifting canning jars in and out of hot water. Jelly: A soft spread made with fruit, then strained so it no longer has pieces of fruit in it. 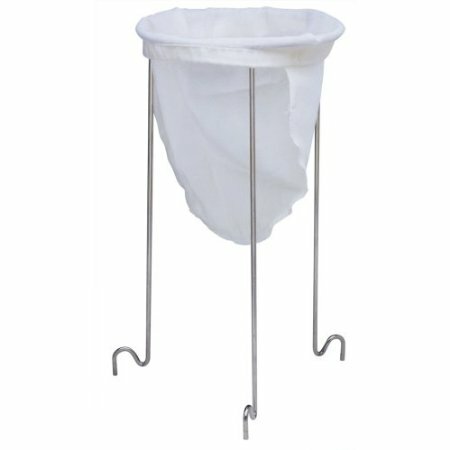 Jelly strainer with jelly bag. Jelly Bag: A cloth bag used to strain jelly. 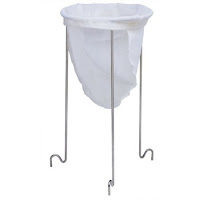 Sometimes a type of colander or strainer lined with two layers of cheesecloth is used instead. 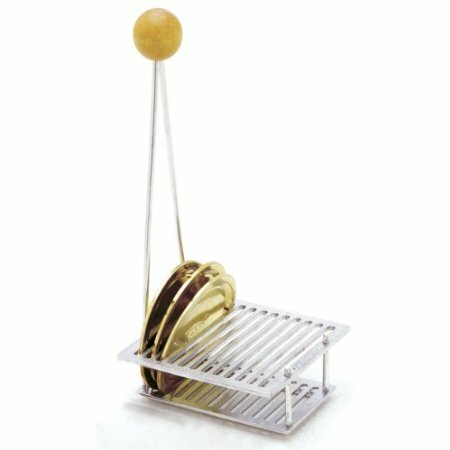 Jelly Strainer: A metal stand with a large ring used for holding a jelly bag over a bowl. Jelly Thermometer: See "Candy Thermometer." Kosher salt: A coarse salt without additives like iodine. It is sometimes used in pickling, although (due to variations in granule size) it can be difficult to measure accurately. Therefore, pickling salt is usually preferred for canning. Canning lids in a lid rack. Lid: The metal disc that sits on top of the canning jar and is initially held in place with a metal ring. Once the jars are cooled and sealed, the metal ring is generally removed so that if the jars loose their seal in storage they don't reseal potentially spoiled food. 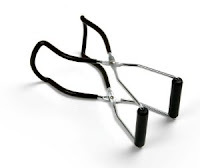 Lid Lifter: A wand-like tool with a magnet at one end, designed for lifting canning lids out of hot water. Lid lifters are no longer necessary, since modern canning lids don't need to be simmered before using. Lid Rack: A tool designed to neatly hold canning lids in pots of hot water. 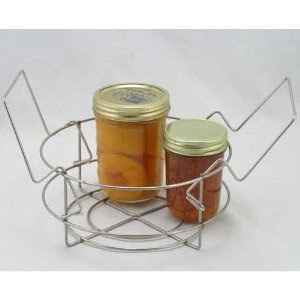 Lid lifters are no longer necessary, since modern canning lids don't need to be simmered before using. Low Acid Food: Food that has a pH higher than 4.6. Meat and vegetables are low acid foods - which must be processed in a pressure canner in order to kill harmful bacteria. Marmalade: A soft, jam-like spread made from citrus and citrus peel. Open Kettle Canning: An old fashioned method of canning where a canner is not used. Hot jars are filled with hot food and lids are screwed on. As the jars cool, the lids seal. This method does not adequately heat foods and destroy bacteria and therefore is no longer considered safe. Oven Canning: An old fashioned method of canning where jars are placed in the oven to process. Because it does not adequately heat foods and kill bacteria, it is no longer considered a safe method of canning. Oxidation: When fruits and vegetables are exposed to oxygen in the air, they oxidize, or turn brown. Oxidation isn't harmful, but may cause textural changes. It can be prevented by keeping cut fruits and vegetables in a bowl of lemon juice and water as you work with them. Paraffin Wax: A type of wax used to seal jars in an old fashioned canning method. It is no longer used because it doesn't kill all harmful bacteria. Pectin: A carbohydrate naturally found in fruit and vegetables. In canning, a powdered or liquid form of pectin is used to gel jams, jellies, and other spreads. Pickle Crisp: A product that uses calcium cloride (naturally found in some salts) to make home canned pickles more crisp. Pickling: Preserving food in a vinegar solution, often with added spices. Cucumber pickles are the most common pickled food, but many vegetables and fruits may also be pickled. Pickling Cucumber: A type of cucumber that is small when mature - typically no longer than 6 inches. For the best pickles, they should be processed immediately after picking off the vine. Pickling Lime: A caustic white powder (also called "slaked lime") used in some old pickle recipes and designed to add crispness. Because it burns, corrodes, and may increase the risk of botulism, it is no longer recommended for home pickling. Pickling Salt: A fine grained salt that contains no anti-caking ingredients or iodine, which can darken pickles and cloud their brine.Also called "canning salt." 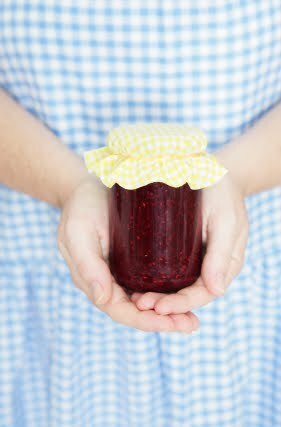 Preserves: A soft spread where the fruit retains it shape and is shiny and transparent. Unlike other soft spreads, preserves do not hold their shape when spooned from the jar. 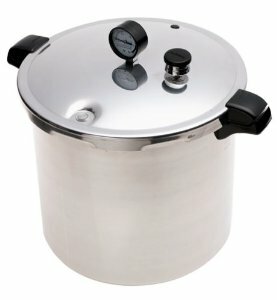 Pressure Canner: A heavy pot with a lid that locks in place and has a pressure regulator. Used to process low acid foods like vegetables and meat. 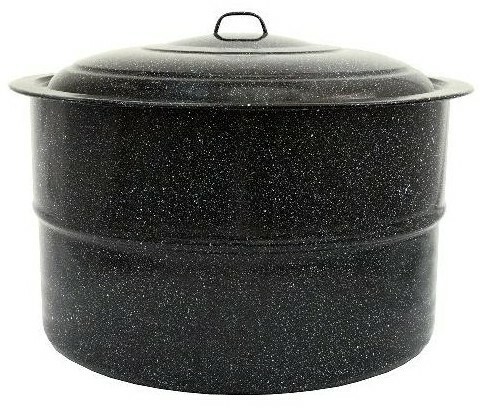 Pressure cookers - similar looking pots used for cooking food - are not suitable for canning; however, some pressure canners are designed to double as pressure cookers. Pressure Canning Method: A home canning method used to can low acid foods, like meat and vegetables, safely. Because the steam inside the canner is pressurized, it can exceed the point of boiling water (212 degrees F.), which enables the method to kill harmful bacteria in low acid foods. Pressure Cooker: An air tight pot that cooks food with pressurized steam. Pressure cookers are not the same as pressure canners and should never be used for canning. Processing Time: The amount of time filled jars are heated in a boiling water canner or pressure canner. Processing times are tested to ensure the contents at the center of the jar reach a temperature that kills off harmful bacteria, and vary according to jar size, contents of the jar, and whether or not the jar was hot packed or cold packed. Raw Pack: Filling canning jars with unheated, raw food prior to processing them in a canner. Relish: A pickled food made from chopped vegetables and/or fruits. It is cooked in vinegar and may or may not contain sugar. It is used as a condiment. Reprocess: Re-can. When a canning jar fails to seal, the contents are reheated according to the original directions, a new lid is put on, and the jars are reprocessed. Screw Band: A metal circle used to hold a canning lid in place on a canning jar while the jar is being processed. Once the jar is completely cool and sealed, it's best to remove the screw band. Simmer: To cook just below the boiling point. Bubbles will form in the pot, but will only burst occasionally on top of the liquid. Slacked Lime: See "Pickling Lime." Sterilizing: Killing all microorganizsms. In canning, jars don't need to be sterilized before being processed in a canner unless the processing time is 10 minutes or less. To sterilize jars, fill them with water but don't put on lids. Place them in a canner filled with water; bring to a boil and boil for 10 minutes. Table Salt: A fine grained salt commonly used at the dining table for seasoning. It usually includes anti-caking ingredients and iodine, which can cause cloudy brine or darkened fruit. Pickling salt is preferred for canning. Vacuum Seal: The state of negative pressure that allows home canned jars to seal and prevent spoilage. When the jar is heated inside the canner, the food and air inside it expand, pushing air out of the jar. When the jar cools and the food inside shrinks, a vacuum forms. The sealing compound on the underside of home canning lids prevents air from re-entering the jar. 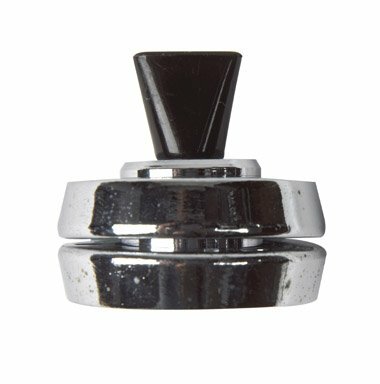 Venting: Allowing air to escape from a pressure canner OR forcing air to escape a jar during processing in a canner (see "Vacuum Seal"). 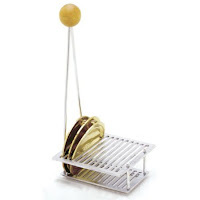 Victorio Strainer: A tool that separates the skins and seeds of fruit. It also purees the "meat" of the fruit. It is commonly used for making applesauce and tomato paste. Weighted Gauge Pressure Canner: A type of pressure canner that has a three- or one-piece weight on the lid that allows steam to vent. The steam causes the weight to rock back and forth during processing, which indicates the correct pressure has been achieved for safe canning. Unlike dial gauges, which should be tested every year for accuracy, a weighted gauge can be used without special testing. Summer is when everyone talks about canning. It's also the season most people do all their canning. But canning needn't end when autumn arrives. In fact, I really like canning when it's not "canning season." I find it more leisurely; I don't have to rush to get all that seasonal produce in jars before it goes bad. And whereas a water bath canner makes the kitchen hot in the summer, canning in the cool seasons is much more comfortable. * Jams. I know, I know. Everyone cans jam like crazy in the spring and summer. But jam made with frozen produce turns out just as well, so I usually end up making what little bit of jam I can during the "off season." Bumbleberry Jam is one great choice; another is Apple Pie Jam. Rose Hip Jam and Orange Jelly are other possibilities. * Soups. I cannot tell you what a blessing homemade, canned soup is in our house during the winter months. Our favorite is chicken soup, but there are a myriad of soups that are can-able. Pick up one of the Ball recipe books for plenty of recipes. * Stock. If you're like me, you use stock in a lot of dishes. But store bought cannot begin to touch home made. You can certainly freeze home made stock, but when I have time, I can it because I find it much more convenient. (No thawing!) For directions on making stock, click here. * Beans. Dry beans are much healthier than store bought canned. (For more info on that idea, click here.) But for real convenience, I like to can those dry beans. * Potatoes. Again, this is about convenience - and having home grown or locally grown potatoes that are shelf stable. You'll find instructions here. * Squash. Winter squash and pumpkins last a while if you keep them cool and dry, but canning makes it last years. Learn how here. Do you like to can in the fall and winter? What are you favorite things to can in the cool season? Recently, Rene from Faith, Farm, and Family Table typed to me: "I want so badly to can meat but I am terrified of poisoning my family...I know you just have to follow the process of pressure cooking, but is there any other major things I should know?" Rene's fear of pressure canning in general or canning meat in particular is incredibly widespread...but, like many fears we have, are easily dashed aside when hit with a good dose of facts. First, let's define some important terms, so we're all on the same page. 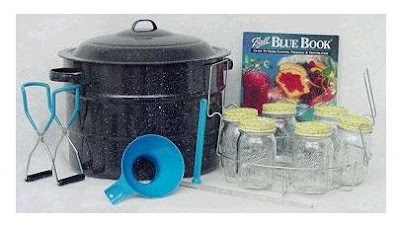 A water bath canner is a large pot with a loose lid. In fact, you can use any large pot for water bath canning, as long as it has a lid and a rack on the bottom that prevents the jars from touching the bottom of the pan. Okay, now that' out of the way, let's talk about not killing your family through home canning. Botulism is a bacterium that's everywhere in our environment. It loves lows low-acid, oxygen-free, high-moisture environments and it can't be killed by boiling, freezing, drying, most household cleaners, or even by radiation. It's nasty stuff. As Erica Strauss of Northwest Edible Life has pointed out, just a single pint jar of pure botulism would kill everyone on the planet. No wonder home canners are afraid of it. Thankfully, botulism poisoning is very rare. In the U.S., the Centers for Disease Control (CDC) receive about 145 reported cases of botulism poisoning yearly. Only 15% of these cases are associated with food. However, among those cases 38%, are from improperly home canned vegetables. There are two ways to ensure your home canned food does not kill somebody (or make them ill). The first involves the acidity level of the food, and the second has to do with heating the food. Botulism hates a high-acid environment. That means if your canned food is high enough in acidity, botulism can't make you sick. Foods that are safe to water bath can must have a high acidity level - 4.6 or higher. Anything below that level of acidity must be pressure canned, or indeed, it might make someone very, very sick. So, to be clear, jams, fruits, and fruit juices are high acid and generally safe to water bath can. (But always check The National Center for Home Food Preservation (NCHFP) to be doubly sure.) Vegetables, meats, and legumes are low-acid and must be pressure canned. An exception is pickled vegetables, which (because of high levels of acidic vinegar) are water bath canned. So why does pressure canning work with low-acid foods? Because it gets the temperature of the food up to 240 degrees F. (much hotter than in water bath canning), and botulism can't live at that temperature. Even then, however, that temperature must be kept for a certain length of time for the spores to completely die off. Hopefully, now you can see why approved recipes - recipes that have been tested in a lab - are vital to safe home canning. 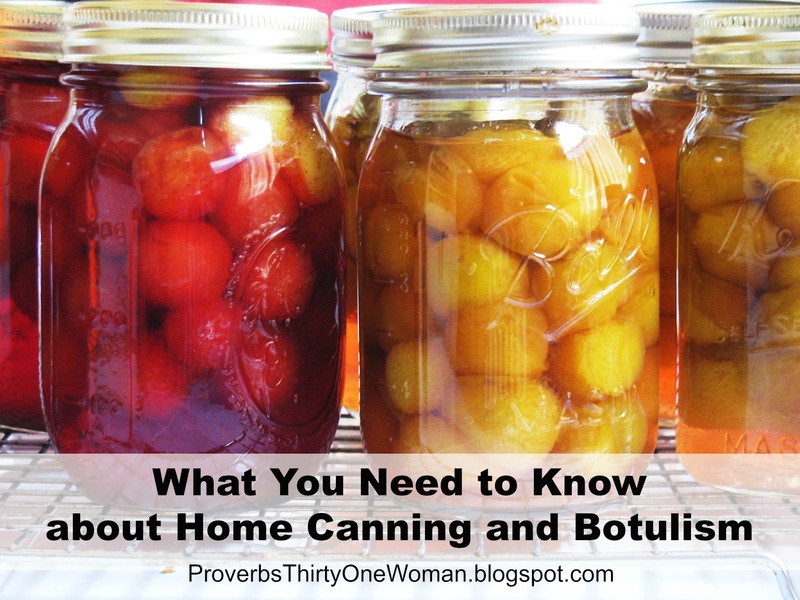 Most home canners have no reliable way to test the acidity of the food they are canning, nor do they have a way to know they've cooked food long enough to kill botulism. 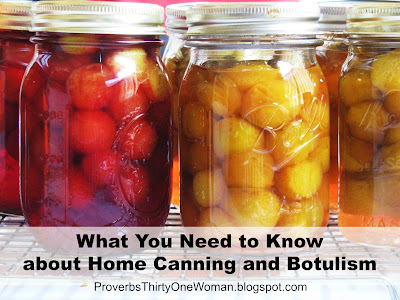 When we hear about home canners giving themselves or others botulism, they've always made egregious choices. 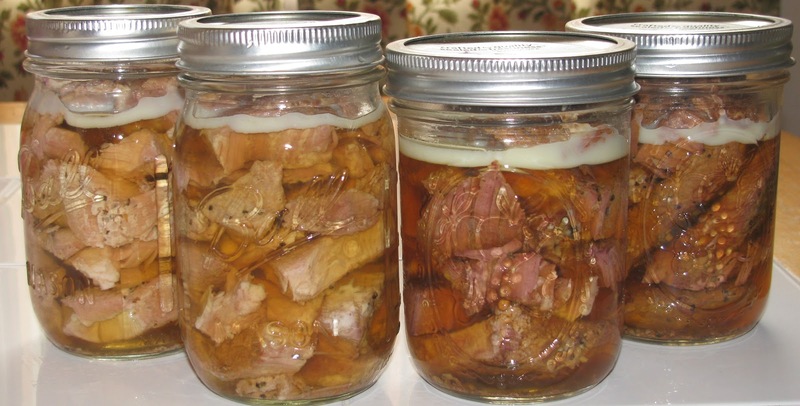 For example, in 2013, a Washington man nearly died of botulism after consuming elk meat he'd processed in a pressure cooker (not a pressure canner - first problem) for a far shorter time than he should have (second problem). When the lids started coming off his jars while in his pantry, instead of throwing the meat away, he ate it (fourth problem). Oy! In 1997, an Illinois man came near death after eating home canned pickled eggs. That's right; there is no approved home canning recipe for eggs of any type. And in 2015, someone poisoned everyone at their church picnic (killing one) by serving improperly home canned potatoes. Many news reports hint that the potatoes were canned in a water bath canner, instead of a pressure canner. Never change a canning recipe in any way, and your home canned foods will be perfectly safe. So how easy is that? Just use approved recipes from a source like Ball or NCHFP. Easy peasy! * Never store your home canned food with the rings on. Sometimes jar lids unseal. If you leave the ring on the jar, it may reseal; bacteria will enter the jar, and you'll never know the food is contaminated. If you leave the ring off the jar, however, it will not reseal...so when you discover the open jar in your pantry, you will throw the whole thing away, rather than eat it. * Don't stack anything (other jars, commercially canned food, etc.) on top of jars. Again, this can make lids open and reseal, just like keeping the rings on does. * Pay attention when you open a jar of home canned food. If the seal isn't tight, don't eat the food in the jar. * If you find a jar with a bulging lid, it is contaminated; don't eat it. * If you open a jar and liquid or foam squirts out, the contents aren't safe to eat. * Smell the food while it's still in the jar. If it smells off in any way, do not eat it. * If there is any mold in the jar, toss the jar. * If you do suspect any home canned food is spoiled, place the jar and food in a plastic bag, seal it, and dispose of it in the trash. Wipe up any spills with diluted bleach (1/4 cup bleach to 2 cups of water, according to the CDC). Knowledge is power, my friends. And home canning isn't difficult. It is perfectly safe to use a pressure canner. Just use a trusted recipe! In case you haven't heard, canning and preserving are back in style. And why not? Home canned food generally costs about half what store-bought canned food costs, has no artificial colors or flavors, has no preservatives, is lower in sodium than most commercially canned foods, and is more nutritious than store-bought food if it's canned at its peak. You can also can meals (like beef stew) ahead of time, and warm them up on days you don't feel like cooking, and unlike your frozen foods, you needn't worry about losing the food in a power outage. Too, canning jars are used year after year, unlike store-bought canned food cans, which must be tossed in the trash or recycled commercially. Many people think it's expensive to set yourself up for home canning, but it needn't be. You can often find the tools you need at garage sales and thrift stores. Which is why I'm typing about canning supplies today. If you want to try your hand at canning this year, now's the time to start looking for used equipment. It's also a good time to start purchasing equipment new, bit by bit, if that's what you prefer to do. So, without further ado, here's the equipment you'll need to start canning. 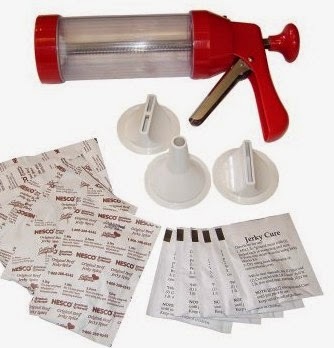 There are two types of home canners: Boiling-water canners and pressure canners. Boiling-water canners and are suitable for fruits, jams, pickles, and high-acid foods. Pressure canners are required for safely canning low acid foods, like meat, poultry, fish, and vegetables. I recommend starting with a boiling-water canner. I think most people find them less intimidating - plus they are less expensive new and may be purchased used. I don't recommend buying used pressure canners, since they must be carefully regulated for safety; older pressure canners may be more prone to exploding during use. New pressure canners sell for about $70 to $100 new. Boiling-water canners are about $30 to $70 new, but I often see them at thrift stores and online auctions for $10 - $35. Too, you can just as easily use a big, tall pot you probably already own. It should be three inches taller than any canning jars you place inside it and must have a snug-fitting lid. Canners come with racks inside them to prevent canning jars from touching the bottom of the pot. If you’ve purchased a used canner without a rack, you can purchase a new replacement for about $15. I've also heard of people making their own by purchasing some extra canning jar screw bands; connect them together with some string, and place them on the bottom of the pan. Round cake cooling racks can also be used in place of a canner rack. It’s not a good idea to re-use glass jars from grocery-store food. These aren’t designed for home canning and may either break during the canning process or not seal the food safely. It's also not considered safe to use vintage canning jars with attached lids. Incidentally, if you have a choice, I recommend purchasing wide-mouthed jars. They are easier to fill and allow for easier removal of contents. 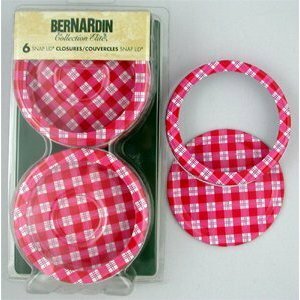 Modern canning lids are easy to use and offer a reliable seal. They can only be used once, but cost a few dollars a dozen. Screw bands are circular, bracelet-like devices that screw onto the top of the canning jar. They may be reused year after year, and can be purchased used. Do not use screw bands that are rusty, however. Other Tools You’ll need a way to safely remove the jars and lids from the pots without burning yourself. New jar lifters (image left) typically cost only a few dollars. You may also want to buy a jar stirrer, but any non-metallic spoon or spatula will work just fine. 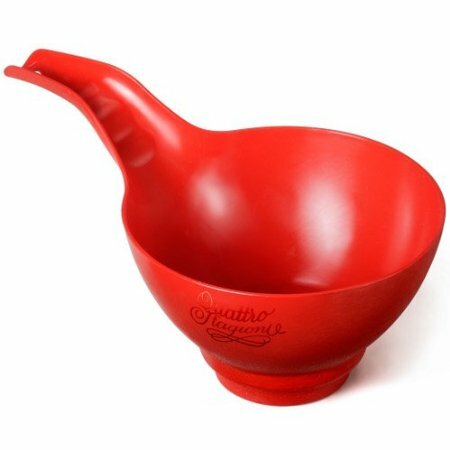 A plastic or metal funnel for filling jars makes the job less messy, and can be had for a nominal price. If you don't want to mess with gathering all your supplies, canning kits are available online and in some retail stores. 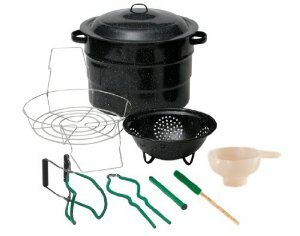 For about $65, you can purchase a boiling-water canner, a jar rack, a handful of jars and lids, a jar lifter, a funnel, and a stirrer. Just add some more jars, and you're ready to go! beef. A few minutes later he returned...without the meat. "I didn't know what to choose," he said. Truthfully, I was a little annoyed, but when I headed over to the meat department and looked at the offerings, I, too, ended up walking away without the ground beef. It was just too darn expensive - about $6 a pound...and I was at a discount grocery store! And it's not just beef. The frozen chicken breasts that for years have been a staple of my cooking and canning have become painful to purchase. Even pork, which has been among the less expensive meats the past several years, has increased in price. According to American Live Wire, beef is at it's highest price in three decades - supposedly because we are exporting tons of beef to China and Japan. Crazy, right? Slate adds that cattle herds are at 1951 levels, and, of course, our population is considerably bigger now. Drought made feed more scarce - and expensive. Costly feed also explains the increase in the cost of buying chicken and pork. Oh, and did I mention there was an epidemic that killed tons of piglets? And when you consider that food costs in general are on the rise - well, it's enough to make you think you may soon need to feed your family Top Ramen for every meal. But thinking specifically of meat prices, what's a Proverbs 31 Woman to do? Assuming you don't want to become vegetarians, that you want to avoid more meatless meals, and you can't raise your own meat? 1. Buy a local steer and freeze it. Yes, this does take some planning, because it will cost several hundred dollars. But it should be much cheaper. (Ours was $2.50 a pound, which is an incredible bargain right now!) It will also be healthier, assuming it's antibiotic- and hormone-free, and possibly grass fed. 2. Look for clearance meat. Not all grocery stores have a clearance section for meat, but check those that do. Frequently. Sometimes this takes a willingness to sort through less than appetizing, gray and old-looking meat, but I can often find something worth buying - and at a greatly reduced price. Just be sure to either eat the meat that same day, or freeze it as soon as you get home. 3. Watch for sales. Look at local store's sales fliers and watch for good deals. When you find an exceptional deal, buy extra and freeze it. Don't fall into the old trap of only buying enough meat for that week; you need to stock up to keep things affordable. 4. When buying larger cuts, like a roast beef, ham, or whole bird, cook it all, but slice off servings and put them on each family member's plate. Don't put the larger cut on the table; in fact, tuck it away in the back of the fridge as soon as possible. 6. Choose less expensive cuts of meat. Gone are the days when that was ground beef! Instead, look for tough cuts of meat, then cook them "low and slow" - on lower heat for a longer period of time. 7. Make the meat part of the meal smaller, and be sure to include other filling items in the meal, like high fiber veggies or bread. 8. With ground beef, use fillers to make it go farther. Cooked rice, uncooked oatmeal, and cooked lentils are classic choices that blend in easily. (Start with small amounts of filler, for less objection from your family. As time goes on, you can try adding more.) Other good filler choices include barley (cooked); beans (cooked and pureed); bread crumbs (Store bought bread crumbs are full of unhealthy soy; save your health and your wallet by saving stale bread or crumbs in the freezer. ); grated veggies (especially zucchini, carrots, and potatoes); pureed veggies (most work fine, but carrots, onions, and celery are classic; mushrooms are also an excellent choice). For meatloaf, burgers, meatballs, and the like, add an egg or two, along with another filler, like oatmeal. 9. If ground turkey or chicken is less expensive, use a mix of ground beef and ground poultry. 10. Choose dishes where a little meat can go a long way, like stir frys, stews, and soups. 1. Avoid processed meats. Some discount grocery stores, for example, sell meat that's already marinated or injected. This is a way of charging more for inferior meat - and it's not healthy, either. Usually, those marinades and injections are full of salt, corn syrup, and other unhealthy ingredients. In addition, things like SPAM, or even canned tuna, are usually not a good deal per serving. 2. Avoid Textured Vegetable Protein (TVP) as a filler, even though many websites recommend using it as a filler. TVP is made from soy, and soy affects estrogen levels in the body, which is linked to cancer. In addition, unless it's labeled "certified organic," it's a GMO product. What do you think? Is your family struggling to keep meat on the menu? 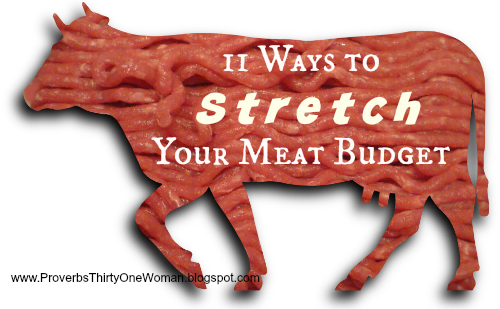 How do you make your meat budget stretch?